Can you tell us about any projects or work experience that you have gained in your internship? Before I get into my intern experience let me explain what I am actually involved in. I work under a company YMBY interactive, and also with employees who produce content for digitally design applications (iOS/Android-such as Audi and the Olympic Committee). More specifically, I am working on an interactive platform conference/competition that calls for a design for change; named “Interactive Beijing.” This year – as an official partner of Beijing Design Week- we hope to inform, inspire and incubate. To put a long story short, we are essentially a TEDx talk, with a general topic of Beijing’s air pollution. We implement unique speakers and specialists, hold mentorship camps, and eventually the competition; all in 2 days. The incentive is we provide a grand prize of 100,000 RMB + (seed money to finalists) the winner/ of our product/idea competition. When it is all said and done, we plan to accelerate and be their preferred incubator. We want to nourish their startup/prototype with supportive investors and our integrated skilled dev team. Least year there was over 300 participants, and 60 competitive entries. This year we plan to double this. 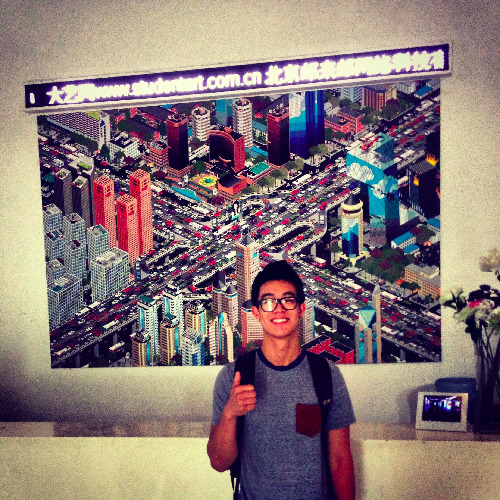 Are you learning new skills or knowledge at your China internship? At my internship, I have acquired new skills and built upon many of my own. Being in China has grown my interpersonal skills immensely. Being a project intern, I get to work closely with the director, with marketing, design, PR, and many other factors of . I work on presentations and present them. I helped private design companies create graphics on Adobe InDesign, Illustrator, Dreamweaver and Photoshop. Dipped my toes in the water of mobile application. I developed press kits, official banners/posters. Talked with Chinese media/print. I worked down the spectrum of the entire project from heading event management to handling sticky refreshments, from presenting to Dutch embassies to picking up smelly trash after a party. I’ve made activity guides, handled countless spreadsheets, researched enough case studies for a lifetime, managed official social media pages, communicated to our partners and attended more meetings that I can keep count of. Most importantly, I’ve learned how to network and the power it truly holds. I learned that China is all about relationships. I’ve learned to keep hungry for new information/wisdom. I’ve learned that professionals are more than happy to give advice. I’ve learned that confidence comes with passion. All in all, what I’ve gained in China is something very special. Its like jumping into a pool of complete foreignness and being expected to swim. There will be struggle, but if you survive you will be stronger. And it hasn’t even been a month. What is the strangest thing you have encountered so far? Saw a woman holding her dog’s hand across the street, duck tongue dried snacks, and hearing rats scurrying in my apartment walls. Is there any advice you would give to future interns, before they come to China?